As an incredibly disorganized person, I need as much help as I can to stay on track if I hope to meet task deadlines and accurately keep on top of project progress. One way to do this is through free project management software, which can increase a person's efficiency and efficacy without running their wallets dry. Still, not all project management solutions are the same. Some agile project management tools are perfect for developers and designers. Others are specifically project management tools for marketers. Even others are geared towards the nuances of vertical industries, like construction project management software. The right tool for you depends entirely on your team or department’s workflow and planning model. Agile tools are great for embracing unique ideas, getting feedback and rapidly creating prototypes. Traditional tools cater to the waterfall methodology. They make it easy to outline clear timelines that are easy to track and manage and assist individuals with their time management. Small teams and individuals might not even need a fully fledged project management solution. 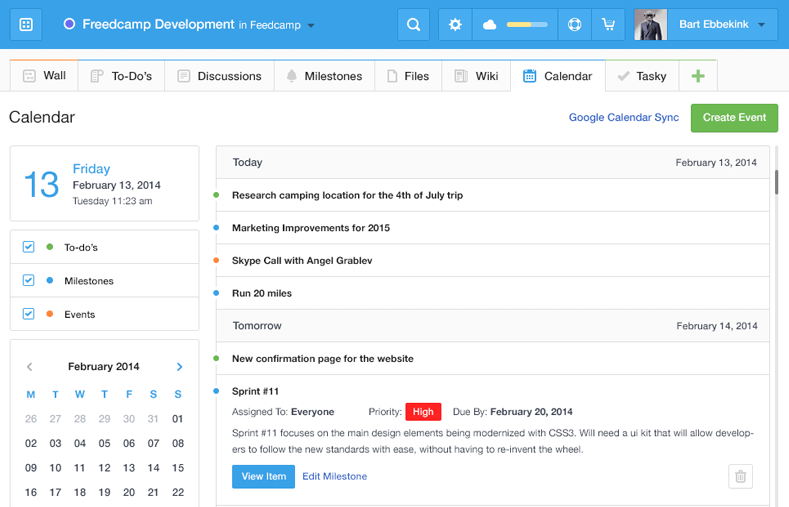 Many get by just fine with simple Kanban boards or task management software solutions. Free solutions are perfect trials to help users understand the way a project management solution complements your existing structures and SaaS-platforms, such as a company's CRM software. Companies or individuals considering new tools should try products out before purchasing them, and there are dozens of options that never require capital. TIP: Prove the value of a project management tool with these project management statistics. 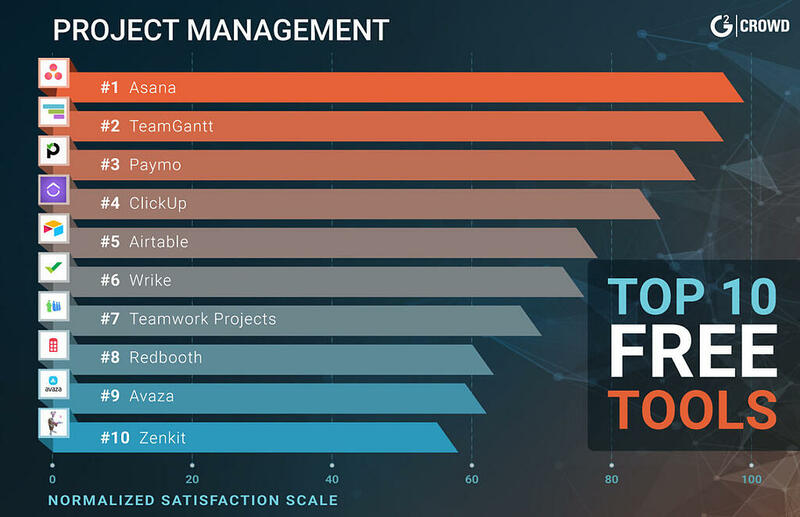 Using reviews from real users, our list of free project management software is ordered by highest user satisfaction as of February 14, 2018. *n/a is displayed when fewer than five responses were received for the question. The list we’ve outlined here includes any project management solution with some free offering. This does not include products that are free temporarily or offer free trials. They may only support one user or one project, but they’re truly free offerings. Scaling, though, will often require full investments. There are also more granular project management solutions, such as free gantt chart software, for those in need of specific project management features. 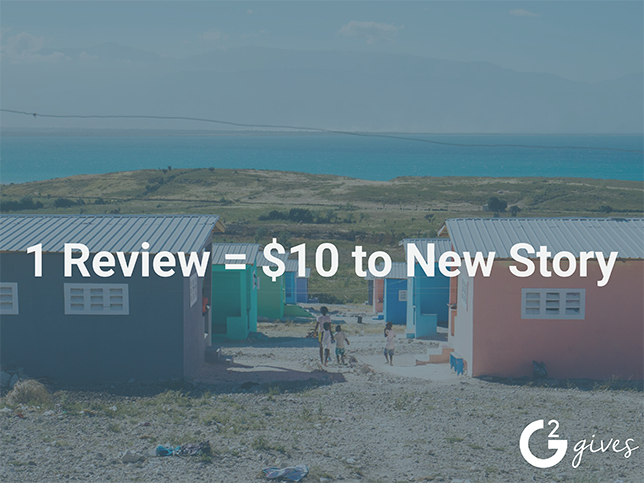 These products alone have well over 4,000 validated user reviews on G2 Crowd and only represent a small portion of the 300-plus project management software offerings listed on our platform. The products are ranked from an in-depth analysis of free project management software's user satisfaction score and must have at least 10 reviews. Asana is the most widely used product in our project management software category with more than 2,500 validated user reviews. 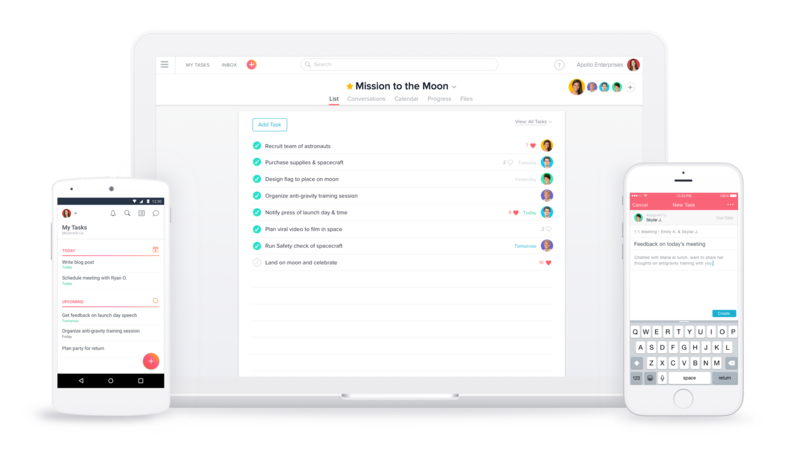 Asana is a cloud-based project management tool that helps both team managers and team members map out every single step and detail of tasks and projects within an organization. Team managers can designate admins to set security controls regarding team member usage to better understand those members’ processes. Additionally, the tool provides granular reporting on your team’s successes and pain points. Asana allows for differing views of team members’ schedules, accommodating whichever workflow the individual member may prefer. 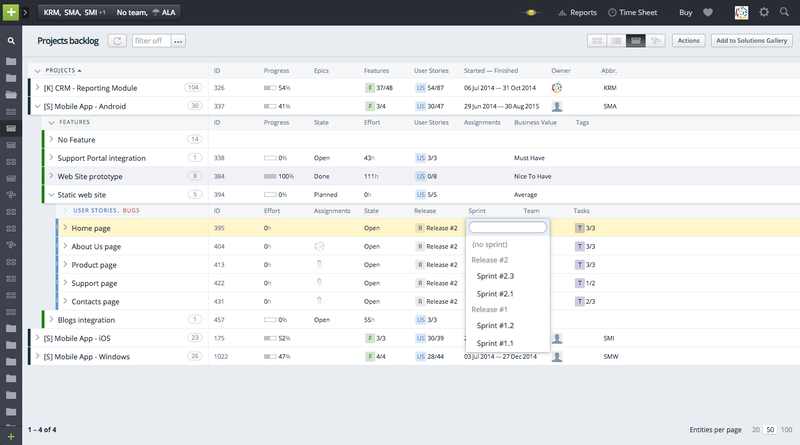 The solution integrates with a ton of file sharing, team collaboration, time tracking, and knowledge management tools. Asana offers three tiers of pricing: Free, Premium and Enterprise. Free is the most basic version of Asana, and with the free plan, teams of fewer than 15 are allowed an unlimited number of tasks, projects and conversations; and have access to basic dashboards and search functionality. The next tier up goes for $9.99 per person per month and includes additional team members, admin controls, reporting and support. TeamGantt is an online project scheduling software built to help you manage your business manage projects throughout their entire lifecycle. 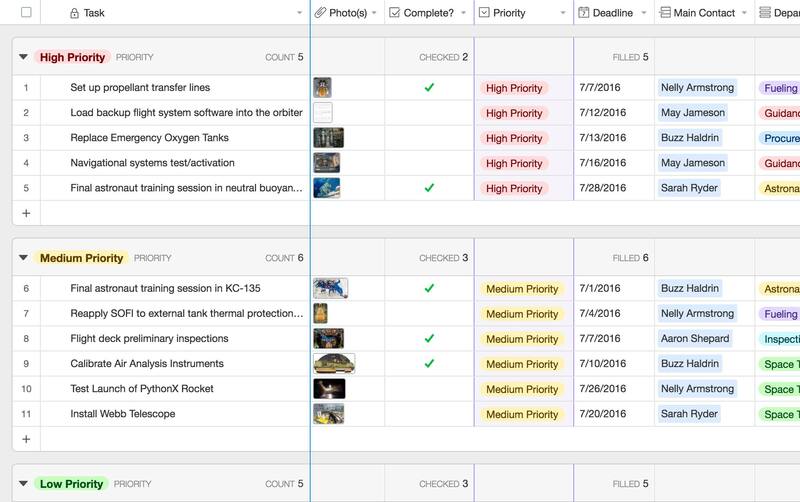 With TeamGantt, your team can centralize projects information; for example, any documents and conversations that are relevant to a task or milestone are immediately connected to that task or milestone. Additionally, team managers can utilize TeamGantt to better manage resources, track team members’ progress and compare that to their original plan and leverage smart time tracking functionality. 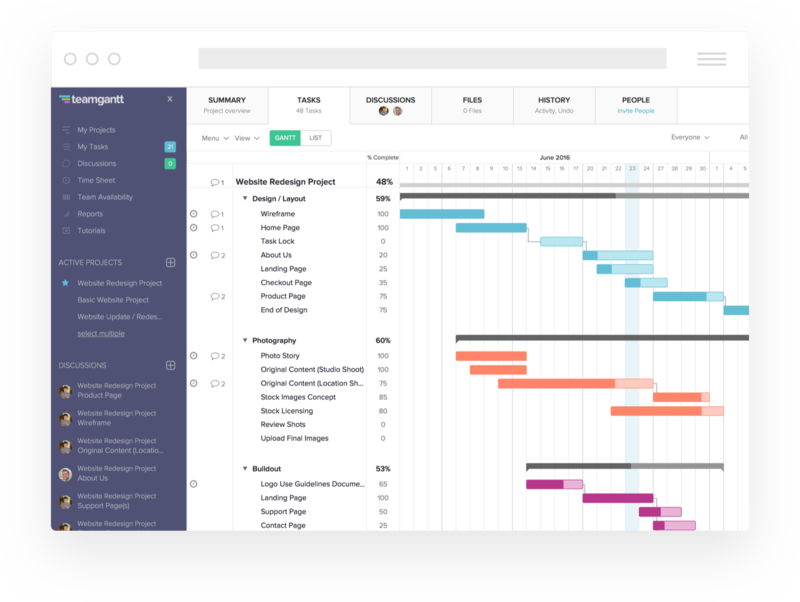 If your team only has one project to plan at a time, TeamGantt’s free version will serve you well, as it includes all the core planning features necessary to see a singular project go through its lifecycle. Some of those core planning features include: forecasting of workloads, team updates, file attachments, and back-and-forth conversations on tasks. Paymo has the ability to turn timesheet data into estimates and invoices. Paymo offers a free version for freelancers to help them manage tasks, clients, and accurately keep track of time spent on projects. Businesses of any sizes, unfortunately, would not be able to utilize Paymo’s free plan. Within the free plan include such features as: to-do lists, an Adobe CC extension, reporting, file sharing, and an API that facilitates integration with third-party applications. 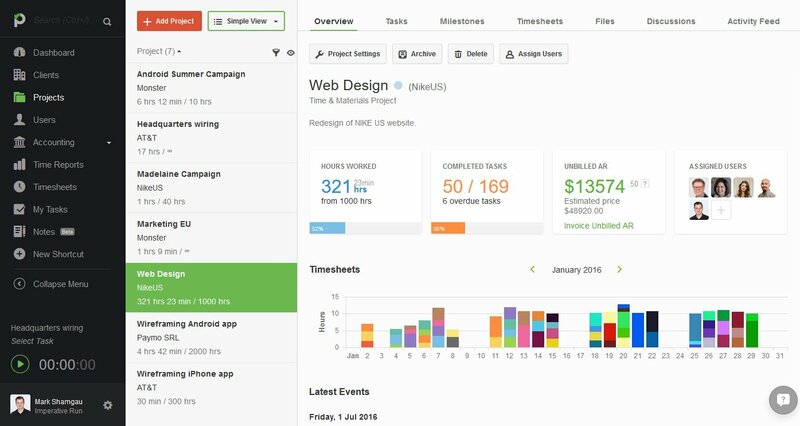 ClickUp is a project management solution that bills itself as a “productivity platform.” One of the unique things about ClickUp is that all of its features are completely customizable, which helps teams from getting overwhelmed and distracted. ClickUp can even provide differing views dependent on admin and access roles. The platform even helps organizations import their project management workflow from other tools into ClickUp. ClickUp provides two pricing points: free (forever) and $5/month. The free version includes 100 MB of storage and accommodates an unlimited number of projects and spaces. Some of the features included in the free plan are: integration with Google calendar, task checklists, a powerful search functionality, both simple and custom statuses, an agile board view, and automated templates. Airtable takes the familiar arena of spreadsheets and turns it into an effective project management tool. (But users can change their filtering, sorting and grouping preferences so that should they not want to stay in a “grid” form, they don’t need to.) Granular, supplemental notes, helpful file attachments, and statuses and priorities can be added to high-level tasks. 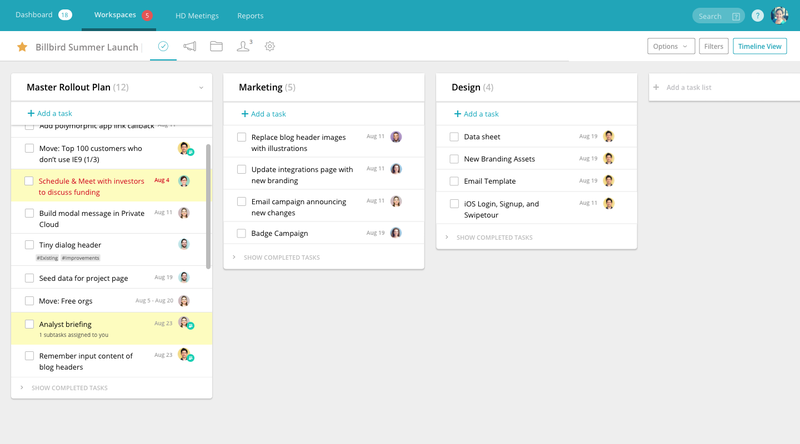 Teams can leverage Airtable’s myriad templates, which simplify tasks such as creating a content calendar, tracking project progress, launching products and planning for agile sprints. Airtable offers a free plan, which includes: unlimited bases (essentially, spreadsheets with tables and tabs), unlimited scheduling views, rich field types, real-time collaboration and commenting capability, and 2 GB of attachment space. Additionally, with the free plan, users can keep up to two weeks of historical data. Wrike is a work and project management solution that creates “blocks” of work, automates the process of assigning tasks and projects, and provides the capability to edit and manage files in real time. Gantt charts help team managers create visual timelines of how projects are progressing; team managers can also better track time, budget and resources spent. 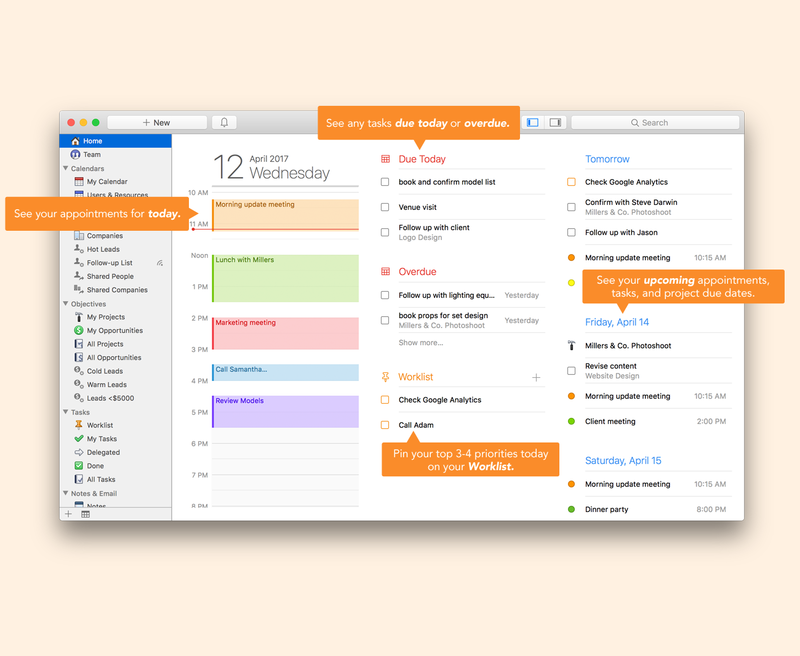 Wrike’s tasks and milestones can be synchronized to Google, iCalendar and Outlook calendars. Additionally, Wrike emphasizes authenticating corporate identities, protecting data and the doling out of admin and access to team members. Wrike has a plan for teams of any size, from small to enterprise to marketing-specific. Wrike’s free plan accommodates small teams that are made up of five users. Some of the free plan’s functionality set includes: task management, file sharing, activity stream, and 2 GB of storage space. Teamwork Projects is a project management app that can be accessed via mobile app and desktop browser. However, the solution does tout itself as a flexible tool that increases team members’ productivity because of the tool’s all-the-time accessibility. Teamwork Projects provides granular organization of both projects and tasks, an easy way to keep track of progress and milestones, and internal communication and file share, all of which combine to keep multiple team members accountable. Additionally, Teamwork Projects has a CRM-like functionality where companies can keep track of clients, partner companies and customers, so that teams can be transparent both internally and externally. 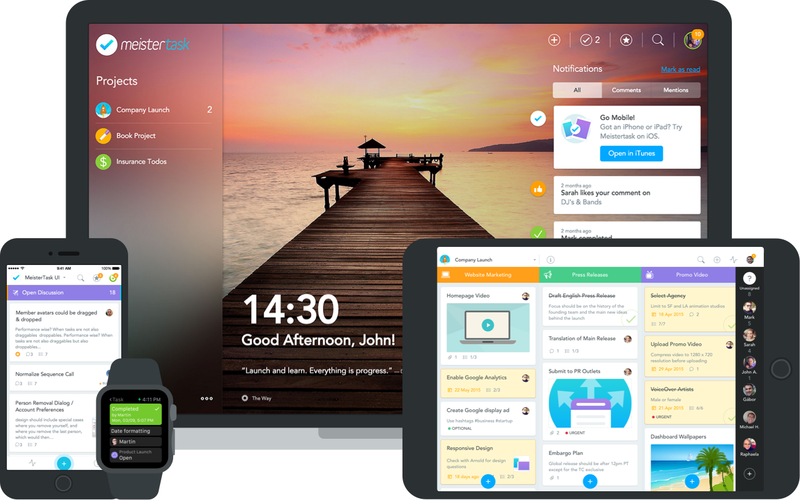 New users can try out Teamwork Projects during a free 30-day trial. However, a “free forever” plan also exists. The free plan supports up to five users, two active projects and 100 MB of file space, along with basic project management features. More advanced features and increase in file space quotas come with the paid plans. Redbooth is a simple task and project management tool that helps team managers and team members keep on track. With Redbooth, teams can better prioritize, delegate and collaborate. The web application takes on collaborative functionality that mimics social media channels, with hashtags and @ symbols. Redbooth integrates with team collaboration, file sharing and knowledgment solutions, as well as provides extensions for Gmail, Outlook and Chrome. Redbooth’s free plan is one of its three pricing offerings; so long as your team doesn’t exceed 10 users, you can utilize Redbooth for however long you’d like. Some of the features included in the free plan are: 2 GB of file storage space, a maximum of two workspaces, Gantt charts and reporting, and project templates. Additionally, Google Drive, Slack and Dropbox are all free integrations even at this basic plan. 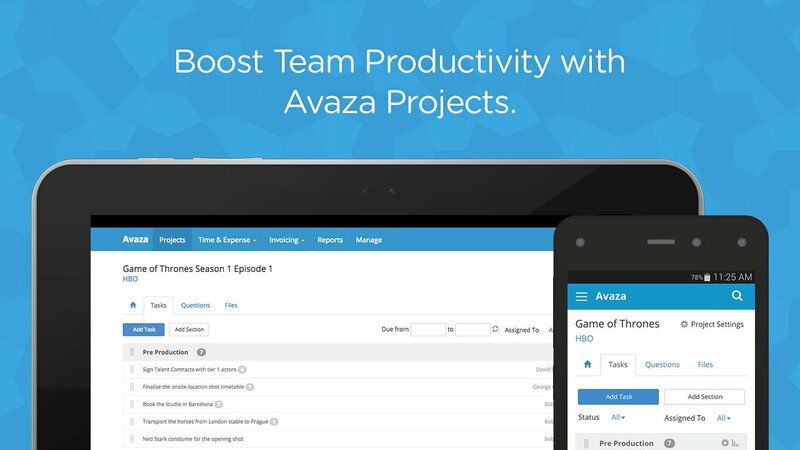 Avaza is an all-in-one project management solution that has some pretty spiffed up task management functionality. With Avaza, team members can create custom task layouts, track project percentage completed, and convert emails into tasks. Team managers can assign appropriate roles to team members, create project templates, and receive an overview summary of projects stats. Avaza can be used by enterprises, small businesses and freelancers, and offers users the freedom to upgrade, at any time, from its free plan. Avaza offers a free plan for individual users. (Actually, anyone who creates an account with Avaza starts off free; there’s no credit card details requirement until your team wants to upgrade to whichever paid plan works best for you.) However, while the number of users with access to timesheets and admin is limited to one, and the number of active projects limited to five, the number of project collaborators is unlimited. The free plan also includes regular, free updates, as well as secure data protection. Zenkit acknowledges that each and every project varies in project management need, so the company has strived to create the opposite of a one-size-fits-all solution. Zenkit providesa calendar, an inbox and Kanban boards, but it also provides customizable relational databases, enterprise search functionality and “formulas” which help team members analyze data across repositories and collections. Additionally, Zenkit integrates with Zapier and simplifies project transfer from both Trello and Wunderlist. For individual users, Zenkit is free. In addition, Zenkit offers four pricing tiers: “Personal” (free), “Plus” ($9/month/user), “Business” ($29/month/user), and “Enterprise” (pricing TBD). The Personal plan is for small teams that have between 1–5 users. There is no limit on the number of collections, except that within a collection (simply a way to organize projects or tasks), only 2,000 items can be used, and there’s a maximum limit of 1 GB of attachment space. MeisterTask is an intuitive project and task management tool that provides flexible project boards that adapts to teams’ unique workflows. The tool integrates with MindMeister, an online mind mapping application that helps users create visual project plans. MeisterTask provides “activity streams” for tasks, which help team members keep track of updates, progress and shared files per task. 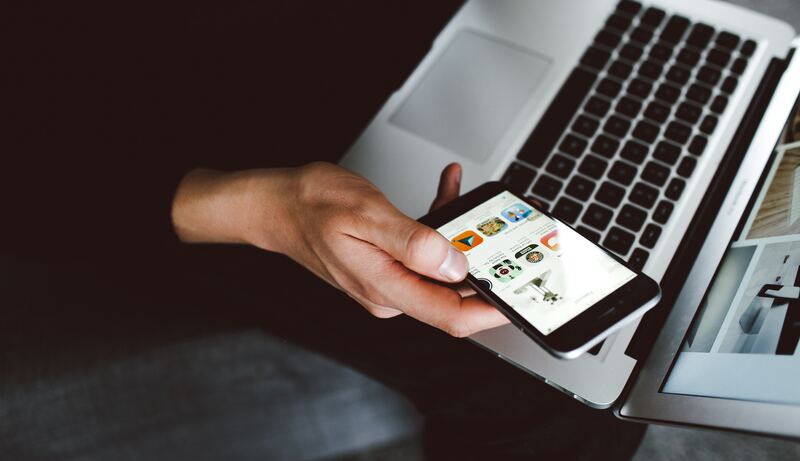 While the solution integrates with numerous third-party applications, MeisterTask also has an API that allows users to create their own integrations. MeisterTask offers a “freemium” plan which, as the website explains it, fulfills “simple & fun task management” needs. In the free, basic plan, users have an unlimited number of projects, tasks and project members. Users can also create customizable dashboards and projects boards, and attach and share files that are smaller than 20 MB. Additionally, MeisterTask allows collaboration between free and paid accounts. With Targetprocess, project managers and team members can see the “big picture” via the solution’s distraction-free overview and scalable hierarchy. 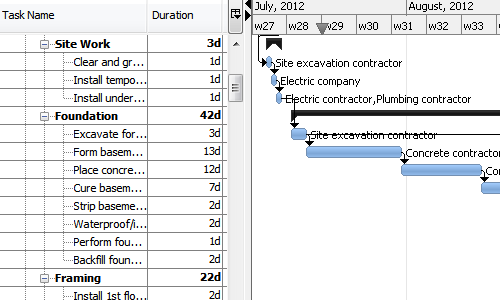 Targetprocess specifically doesn’t utilize Gantt charts to display progress of projects. The solution encourages agile workflow processes, transparency through social media-esque notifications, and the identification of problems and management of risks. Targetprocess is available both as an on-premise and SaaS solution. There are three Targetprocess plans: “Team”, “Company”, and “Enterprise.” The Team plan is free and hosted in the cloud, and does not limit the number of users who can have seats within the tool. However, what is limited is entities such as editing and managing cards, setting up custom fields in task management, creating tasks, and identifying bugs. On the free plan, organizations can have up to 1,000 entities. Podio puts everything relevant to a project on one page; file uploads, progress statuses, real-time comments, and deadlines are all laid out on one dashboard. The platform mimics an “open-plan office” by fostering transparency and constant inter-team engagement. With Podio’s task management functionality, team managers can break down projects and workflows into easily manageable and delegated tasks. 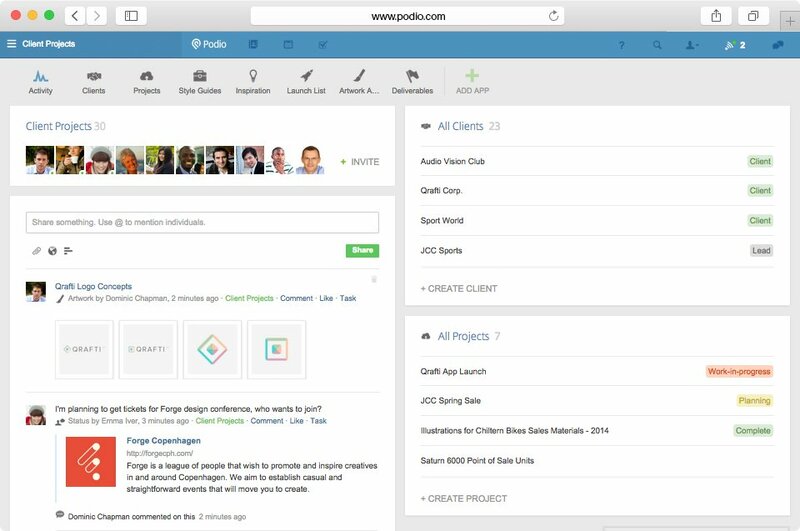 Podio integrates with file sharing services, marketing solutions, and customer support and help desk tools. Podio offers varying pricing tiers, which are priced per employee per month. Organizations that have fewer than five employees (and five external members who are registered under a separate domain) in a workplace can utilize Podio’s free version. 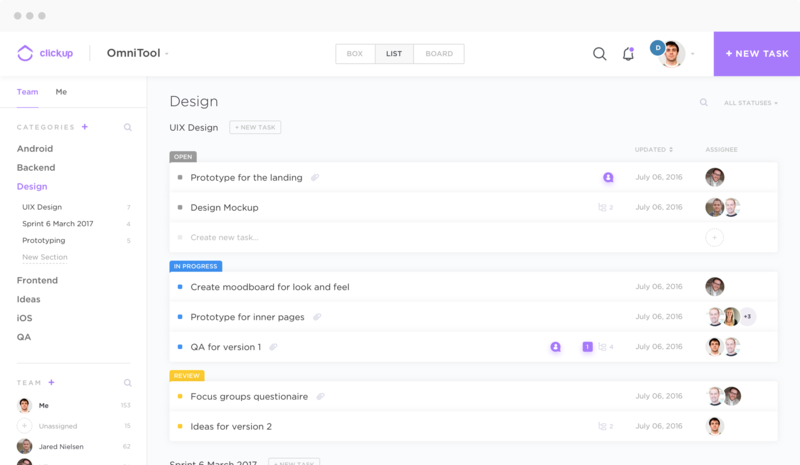 With the free version, users can create workspaces (to manage and keep track of projects) and apps (to organize and track tasks within projects). 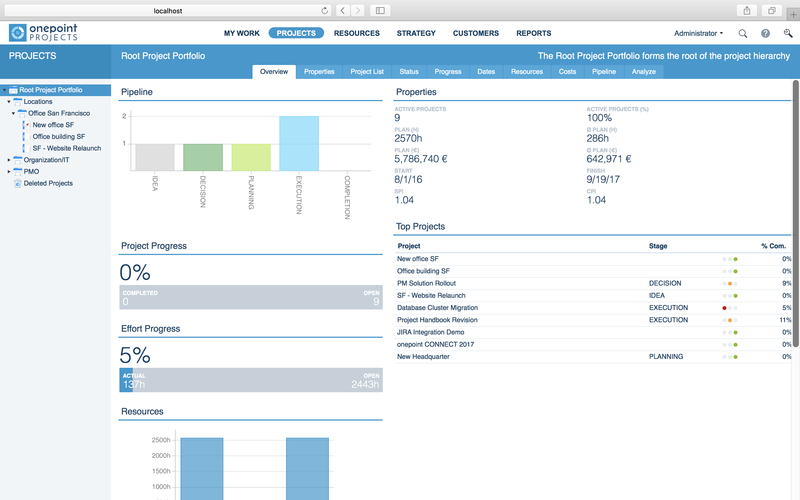 onepoint PROJECTS is a web-based project portfolio management application that plays well with agile projects; it also integrates with Jira and Slack. 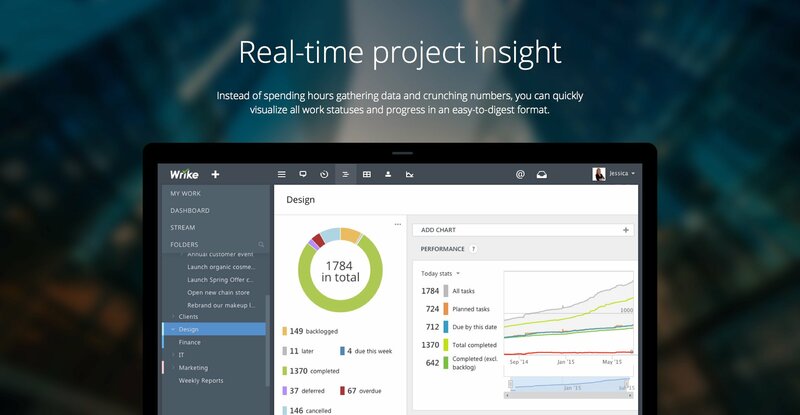 With onepoint, team managers can leverage project pipelines, create dashboards to evaluate existing projects and portfolios, analyze resource allocation, utilize a drag-and-drop enabled Gantt chart, and create activity streams and project reports. onepoint is free for single users and for teams made up of fewer than four users. Both the single user and small teams free plans would be deployed on-premises; the difference is that the former is locally installed and the latter is deployed on a group server. The higher-paid plans (enterprise server and enterprise cloud) are, respectively, on-premise and cloud-based, and provide free 30-day trials for potential users to try them out. The free versions are more pared down in functionality and feature set that the paid versions, but it makes sense, as smaller teams have different needs and requirements than enterprise ones. Daylite is a CRM and lead management solution that also helps teams keep track of their projects. With Daylite, team managers and members can delegate tasks, build their own pipelines that track progress on a project, and keep an eye out on upcoming due dates. Daylite is built exclusively for Macs, iPhones and iPads, and it best benefits small organizations. Daylite is a contractless, pay-by-the-month solution, but offers discounts for those who commit for a year. Education and nonprofit organizations qualify for a 50 percent discount on the yearly plan. Users can test out the Daylite waters with a free 30-day trial. That 30-day trial doesn’t come with any limits to the number of contacts, team members, projects and tasks. Additionally, Daylite does offer a limited free plan called Daylite Cloud Free — that comes with limits on storage, number of projects and opportunities, and contacts — but it requires the user to sign up for a paid Daylite Cloud plan first. 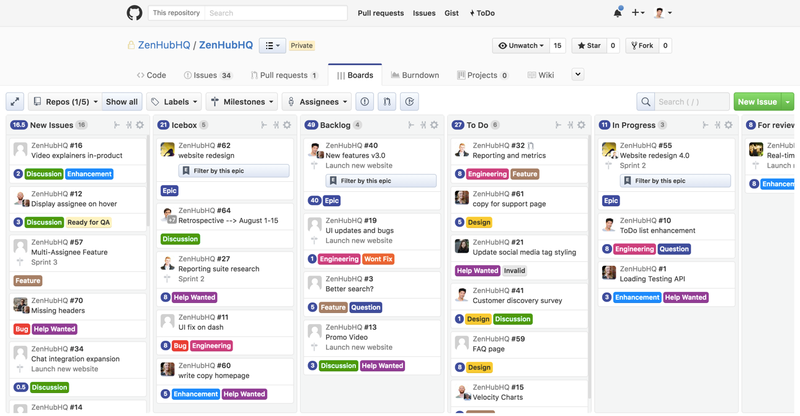 ZenHub eases the task of managing and tracking GitHub issues, and the solution is built specifically for developers. Developers benefit from ZenHub’s ability to track pain points in development work. With ZenHub, teams can create task boards that visualize workflows, efficiently plan sprints and milestones, and better predict project resources and plans based on actionable reports. Both ZenHub’s business and enterprise plans offer free trials (14 days for the latter and 30 days for the former). However, a completely free plan does exist for public, personal and academic repositories. The pricing comes into play when teams need to use private repositories. If your organization is a nonprofit or you are a student, you can always qualify for a free license. Additionally, if your team has five or fewer users, ZenHub offers full access to its software’s features for free. RationalPlan is an easy-to-use project management tool that streamlines portfolio management, resource management and team collaboration. With the software, project managers can create consistent project plans, allocate resources, analyze workload, and even tailor the solution to their specific industry need. RationalPlan’s varying pricing tiers come with different capabilities for tracking metrics on tasks and projects as well as differing storage capacities. Users can either pay up front for an on-premise solution or pay monthly for its cloud services. RationalPlan Single is RationalPlan’s most pared-down project management solution. One caveat is that its freeware option is only available for Linux operating systems. With the Single version, you get RationalPlan’s basic features (including the assignment of differing access rights across multiple users), task management, project management, and resource management functionalities. ProjectLibre provides free and open-source project management software that has seamless compatibility with Microsoft Project files. That compatibility helps companies of any size do away with dependence on a bloated, expensive and complicated project management architecture. ProjectLibre currently offers two versions of its disruptive solution: an open-source, desktop software and an Enterprise Cloud solution. ProjectLibre’s open-source plan makes for even more affordable their cloud solution. ProjectLibre is compatible with Microsoft Project versions 2003, 2007 and 2010, which is helpful, as ProjectLibre is built to replace the costly enterprise licenses of Microsoft Project. With ProjectLibre, users can create and access Gantt charts, create network diagrams and charts, and keep a historical record of resources across the organization. Waffle.io is a project management tool tailored to the workflow and thought processes of developers. Users can connect GitHub repositories to a single Waffle dashboard, which helps with viewing and pulling requests on an organization-wide level. Waffle also facilitates the creation of statuses in real time and tracking of goals and progress throughout a project. Waffle offers four different plans: open-source (free), personal ($5/month), organization ($49/month), and takeout (an on-premise solution for enterprise companies). All four plans allow for unlimited users and projects. Waffle’s open-source plan includes a singular view of multiple repositories, integration with Slack, reporting metrics, and access to WaffleBot. Redmine is an open-source project management and issue tracking tool written on the Ruby on Rails framework. The web application can be used across platforms and databases. 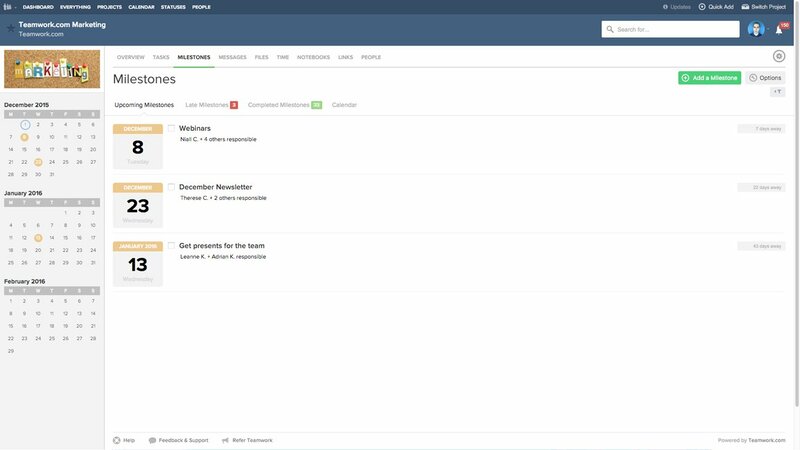 With Redmine, you can manage multiple projects within a singular Redmine instance, assign admin roles and user permissions, set up workflow transitions, create Gantt charts and calendars, keep track of time spent on projects and issues regarding individual tickets, and mine through existing data repositories. Redmine is available in 49 languages. Because Redmine is open source, it is built and maintained by community volunteers, hence why and how the application is available in so many languages. Forums exist to help all users leverage the most out of Redmine. If you’ve never used project management solution before, you should know there are a wide range of benefits. They can obviously help to organize projects and orchestrate tasks, but collaboration, monitoring and communication tools will only add to your increased efficiency. Visit our project management software categories to find more free or commercial options and find the best project management solution to fit your company’s needs.Reviews can be tailored to view specific ratings, company sizes, user roles, user industries and categories to help determine which product will work best for your unique business. For other free solutions, be sure to check out the best free CRM software to help teams manage their customer relationships. If you want to learn more about project management, check out our articles on topics such as What is Project Management and 14 Project Management Skills to Look for in a Hire. 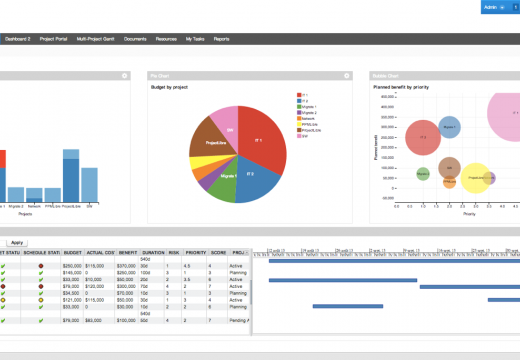 Use Free Project Management Software?